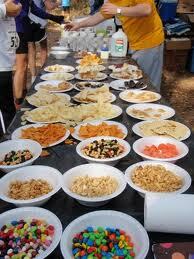 You might think that since an ultra marathon is really just an extended marathon, that the nutrition for these would be the same for a marathon, just spread over a longer time. If you do 4 or 5 gels for a marathon, then for a 50 miler, you just double that, right? Well, thank goodness that is not the case, because I would have had to find another sport! The first difference between marathons and ultras is that a certain level of self-sufficiency is usually expected at ultras. Yes, most have aid stations, and some of those may actually provide everything you might need to make it to the finish line successfully, but that is not always the case. We'll get to that later. First off, let's talk about supported races. These are ones with aid stations anywhere from 3 - 10 miles apart. Yep, they can be up to 10 miles apart, even further in a few. When you are running over difficult terrain, in whatever conditions Mother Nature decides to throw at you on that particular day, even 5 miles is a LONG way to go without aid. So...you carry your own. At a well supported race like Rocky Raccoon, I wear a waist pack and carry a handheld water bottle with an extra pocket for a gel, etc. 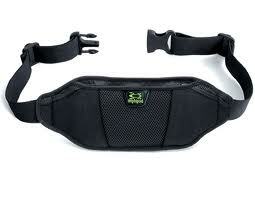 My handheld usually gets me to the next aid station for winter races. 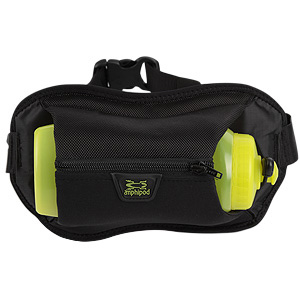 If the distances will be a little further, or the temperature a little warmer, I carry the handheld, and have a different waist pack which carries a backup bottle. that doesn't bounce, and holds alot of stuff. I do a Vespa every 2 - 3 hours during my ultras, or at least as long as my stomach will accept it. Later in the race, your stomach is no longer your friend, but a very sensitive enemy that you are trying to co-exist with. What works for you at this point can be learned only through trial and error. No two people's needs will be exactly the same. Since most of the races I do are on loop courses, I pack a large ziploc type bag and label it for each lap. The more thought you can take out of your race day experience the better. I can remember what lap I am on. I can not remember what I should pull from my bag to restock my pack with. So, when I reach the start/finish point, I just get the next bag in line - the one with the current lap number on it, and put everything in it into my waist pack. No thought required. 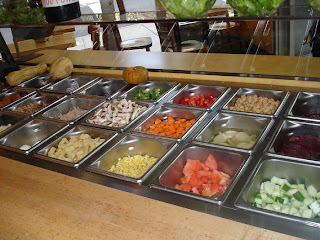 Yep, I see cookies, nuts, candy, chips, p b & j sandwiches ......ahhhhh!! Nevermind how nasty the hands of the runners ahead of you were - by this point, you would lick their hands to get a small treat from these nice folks!! Later in the evening this will change some, with warm options being offered, like chicken broth (Nectar of the Gods when you are sodium deficient), potato soup, quesadillas, etc. You will also find things that at first don't make sense - Coke? (Aren't you people supposed to be healthy?) - a good pick me up late in a race, and flat coke settles my stomach; Ginger Ale? (What kind of run is this?) - Actually, ginger ale does a great job of settling a sour stomach, as do ginger snaps. These little oases on the trail are also where kind people will refill your handheld or hydration pack, and if you are lucky, they may lance, drain, and tape up your blisters. Even though this seems like quite the buffet, this is not designed to be your primary source of fuel - that is up to you to provide, and it is something you have figured out after many hours of long runs leading up to this point. Bringing us to unsupported, or minimally supported races. 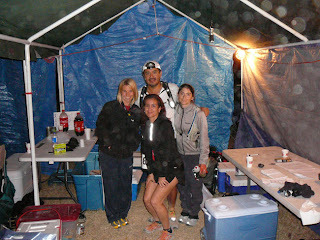 My current favorite race is the Cactus Rose 50/100 miler in the Hill Country of Texas in late October. Here is an excerpt from the race doc..
Cactus Rose is a race for veteran trail runners and it seems to me that most veteran runners usually take care of their own nutritional needs. It seems redundant to supply food for a group of people who don’t need this type of help. So… there are NO volunteers at ANY aid station and we do NOT provide ANY food. There is one exception to this… and that’s Olga. She wanted to cook some hot food during the late hours for those who would be out there all night. So, there will be a hot grill going all night at the equestrian aid station. Also, there will be one going at the Lodge too. This is a great race, because strategy is SO important. They let you go out onto the course the day before, and drop your own containers at specific points. They will have bottles of water on tables at a few spots, but everything else is up to you to bring. And the loops on this course are 25 miles long, so you have to put alot of thought into this one. This is where having done a few of these races comes in handy, because you can look back on what kind of food appealed to you at different points in your races, and you add those to your box. My personal favorite at Cactus last year - animal crackers. Go figure. it is a beautiful sight! After these races, I am usually not hungry for quite a while, believe it or not, so I bring plenty of Ensure - its a meal replacement that they give the sick or elderly to give them some much needed calories. It is in small bottles - you can buy it at the grocery store or Walmart (one of Dante's loops). I drink alot of these in the week or so after the race, even when I get my appetite back. I figure that I burn at least 10,000 calories during a 100 miler, and my metabolism is supercharged for days after, so the more calories and protein I can take in, the better. Well, I am tired of reading this, so I am sure you are too :). More later. Message me with any specific questions, and I will address them in a later post. Great job! I think it is funny how us runners say we "do a Vespa" to "took a gel". It's kind of like "doing drugs" or "taking drugs". You never hear anyone say they "ate" those things.